Unlike the Ents in Tolkien’s “Lord of the Rings,” real trees can’t walk away from danger or fight their own battles. When climate becomes inhospitable, forests can only shift ranges over very long periods of time. This isn’t a problem when natural changes in climate occur slowly. At the end of the recent post-glacial period, it took 4,300 years for the ice sheet to melt back from Middletown, Connecticut, to St. Johnsbury, Vermont—averaging 245 feet a year. Forest communities in front of the glacier gradually migrated northward in its wake. Evidence now clearly shows that carbon emissions generated by engines of the industrial age are causing temperatures to increase at a rate well beyond what forests can adapt to. U.S. Climatological Network Data reveals that the mean annual temperature has increased by 3.8 degrees since 1835, with 70 percent of this rise occurring since 1970. Considering the two computer models used in a New England regional climate assessment study, Barry Rock, professor emeritus of the Institute for the Study of Earth, Oceans, and Space at the University of New Hampshire in Durham, predicts that “Within the next 100 years, Boston could have a climate similar to either Richmond, Virginia, or Atlanta, Georgia.” These computer models project that the average regional temperature will rise between 6 and 10 degrees over the next century. David Kittredge, a professor of natural resource conservation at the University of Massachusetts and forest policy analyst at the Harvard Forest, sees several scenarios. “If we get a climate more like that of Pennsylvania, Maryland, or West Virginia, we could still have a sugar maple component in our forests.” Of the five computer models created by the U.S. Forest Service to predict the geographic shift in the ranges of forest species, only one foretells that global warming will cause sugar maples to disappear completely from parts of New England. Even if the climate warms considerably, our forests will still support the growth of some sugar maples, especially in higher terrains. Although the range of sugar maples changes slowly, the flow of sap in a sugarbush is dynamic and depends on fine temperature variations that occur daily throughout late winter and early spring. Sap flows best when nighttime temperatures drop into the mid-20s and when daytime highs reach around 38 to 40 degrees Fahrenheit. From here the effects of climate change on sap flow are harder to predict. 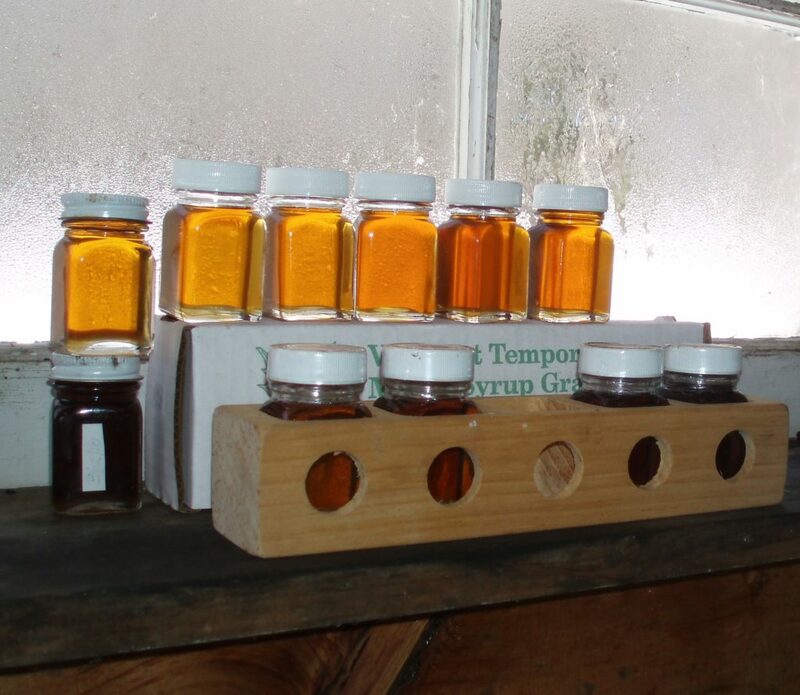 If the daily cycling between freeze and thaw occurs less frequently, maple sugaring will suffer, as it will if the season is shortened by several weeks. But if sugaring as we now know it is simply shifted earlier into the year, the effect could be less pronounced. Research conducted by Martha Carlson into how climate change is impacting forests and sugar maples began at the University of New Hampshire in Durham where, as a Ph.D. candidate, she met Barry Rock. Carlson’s findings indicate that acid rain, climate change and other sources of stress are the probable cause of a significant drop in the sugar content of maple sap during the past 35 to 40 years. In the 1970’s it took 25 to 30 gallons of raw sap to make 1 gallon of syrup. Nowadays, 45 to 50 gallons of sap must be boiled away to produce the same yield. The maple sugar industry can compensate somewhat for the uncertainties of the shifting climate. According to Dr. Timothy Perkins, director of the University of Vermont’s Proctor Maple Research Center, “The best equipment in the sugar house isn’t going to make you any more money. It’s how you manage the sugarbush that counts.” Producers need to tap their trees earlier, before the sap starts to flow, so they can gather the best quality sap of the season. Old tubing must be replaced with new, which is made of superior material and is more efficient. Getting rid of leaks in the system will help, as well as using a vacuum system for collecting sap. Collectively, these steps can help mitigate the problem. No matter what steps are taken, the wheels have been set in motion. The question is: How far down the road—or up the slopes—will sugar maples have to travel before we put the brakes on climate change? Michael J. Caduto is the executive director of Sustainable Woodstock. This article is adapted with permission from his book “Through a Naturalist’s Eyes: Exploring the Nature of New England” (University Press of New England, 2016).